Gyvelborg is now able to provide the opportunity to host your next party. Our Luxury Party-tent can be rentet from April – October (not week 26-32). 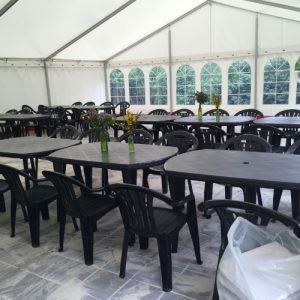 The Party-tent accommodates up to 75 guests, which is enough space for most parties. Everything from family-gatherings, birthdays, childrens-parties and company-arrangements. You have the opportunity to order meet for the barbecue directly in our farmshop, and we’ll provide the grill, plates and cutlery. In the summer you can use the nearby campfire outside for pancake backing and more “hygge”. In connection to your party, we are able to accommodate 35 people in our Luxury cabins, Comfortable tents and family apartment. And of course you can bring your own tent or camper and stay on our campsite. 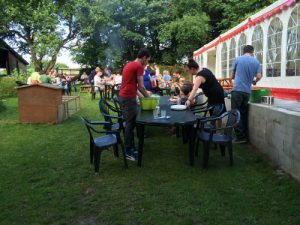 A different kind of party, which can be combined with other activities on the farm. Contact Jellemien to hear more about your options for a personal party and booking of the Party-tent. You're always welcome to contact Jellemien. Gyvelborg Øko Camping er et skønt sted at campere for både voksne og børn. Her kan man se, hvordan en landmandsfamilie driver et landbrug på en god og bæredygtigt måde. Vi passer på naturen og hinanden. Nyder nærværet, dyrene og de gode rene råvarer. Kødet er helt unikt i smagen, det smelter på tungen og når stegen er i ovnen, dufter hele huset af barndom – af farmors lækre søndagssteg. Altid får man en hjertelig modtagelse af Jellemien og Willem og føler sig som personlige gæster hos dem. Prøv det – en helt anderledes campingoplevelse.